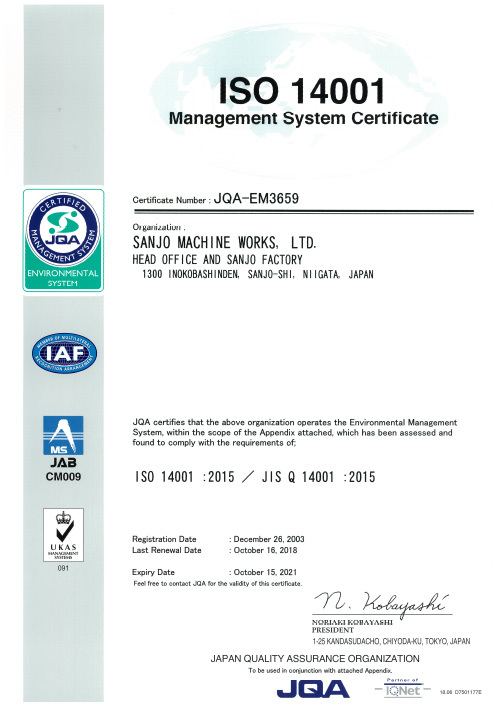 We,SANJO MACHINE WORKS, LTD. ,will recognize the concern toward the environment preservation as our duty to protect rich environment, and we will positively cope with the environment preservation activities. 1. We will try to organize our environment preservation activities suitable for our business(design/development and production of industrial machines, machine tools, forged products, metal molds and rotary dies.) and try to make continuous improvements of the Environmental Management System within the workable scope, and try to reduce environmental loads, prevent pollutions and conserve environments. 2. We will observe the environment-related Laws and Regulations and the other Requirements agreed upon by our company. 3. While we will regularly review environmental impact from where we design products to where customers use and dispose of them, we will make the necessary efforts. In particular, in order to realize reduction in environmental loads, we will make continuous efforts to reduce energy usage with our production activities. 4. We will try to carry out our environment education for all employees and raise awareness of environment preservation. 5. This policy will be made in writing and open to the general public as well as thoroughly known to all our employees. Design / Development and Production of Industrial Machine, Machine Tools, Forged Products, Metal Molds.